HWC Magazine would like to give a special thanks to Chieko-san Kakuma for her delicious recipe. We loved her delicious Super Easy Crab Salad recipe and we know you will too! Sometimes, the simplest recipes are the best. We used spring fresh ingredients and just a touch of curry powder to bring this salad to a new level. However, it is the diverseness in textures that makes this dish such a delicious bite. 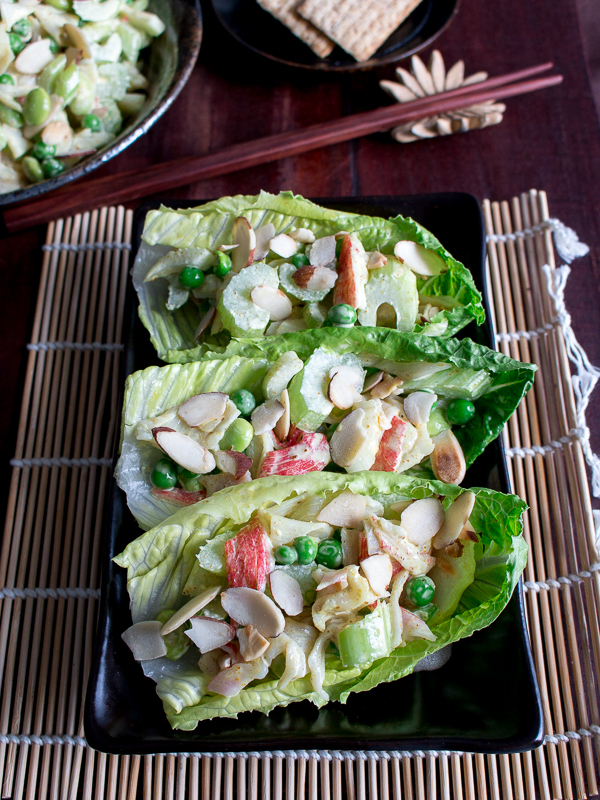 You have the crunchiness of the celery and toasted almonds, the delicate tender sweetness from the crab, peas and edamame beans that just pop in your mouth and the creamy texture of the Kewpie Japanese mayonnaise to bring this whole easy crab salad recipe together. Curry powder is one of those spices that in our books is a must have. Even just a little pinch of curry powder brings out that umami flavor in this dish. 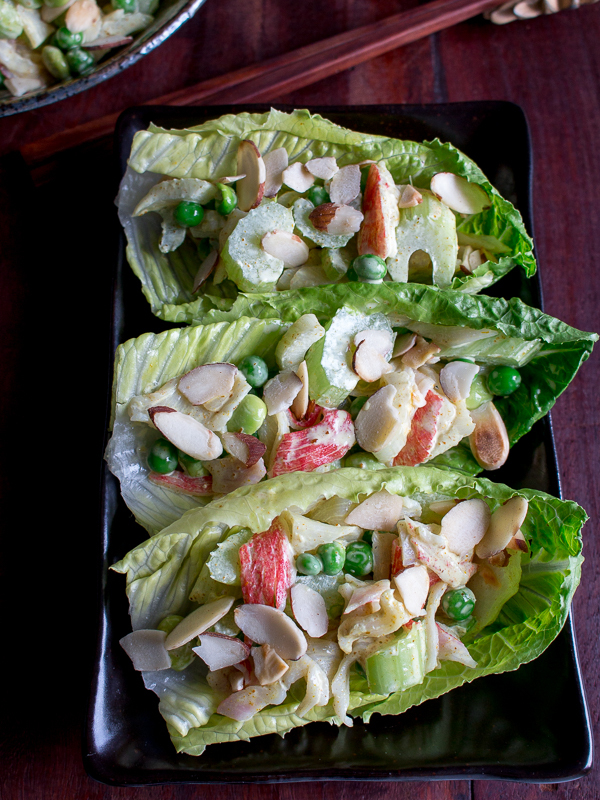 This easy crab salad is not spicy but just well-balanced. Celery is VERY expensive in Japan. Well, let me rephrase that…EVERYTHING is expensive in Japan. In Japan, celery is sold by the stalk and not by the bunch and each stalk is about $100-$125 yen maybe even more… that is roughly about $1 USD. 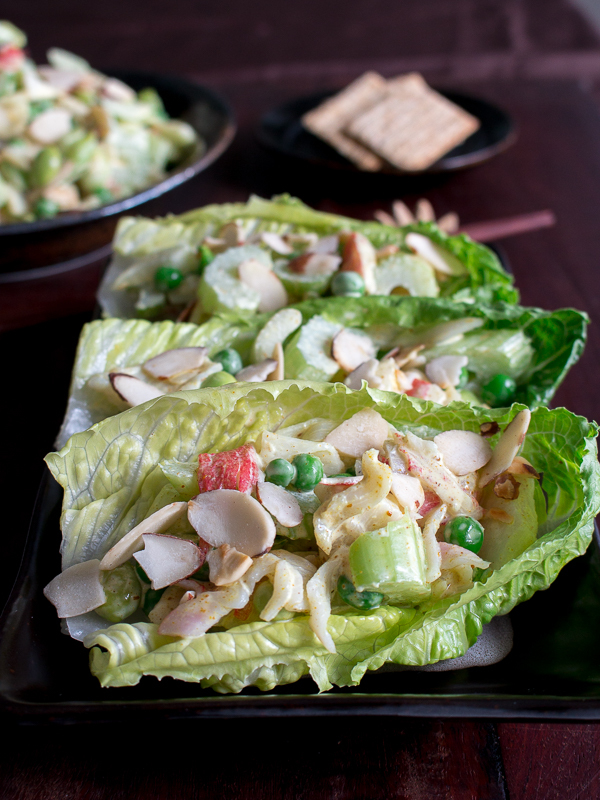 Chieko-san did not originally add edamame beans or peas to her version of crab salad but we wanted pop in a little extra protein, fiber and vitamins in our salad. 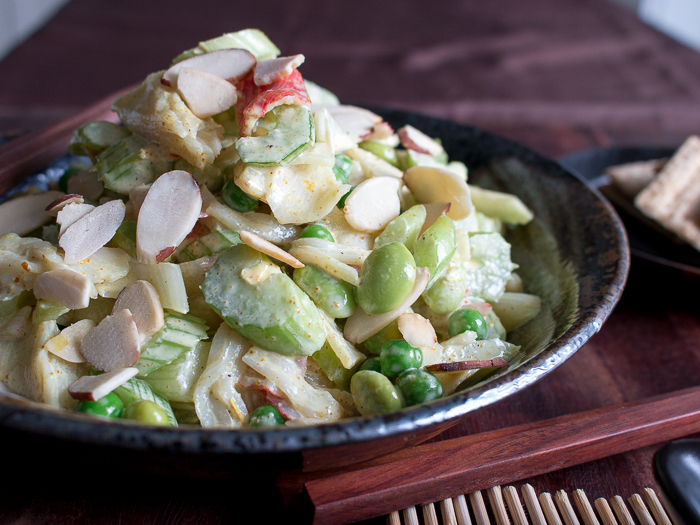 If you want to make a vegan version of this salad, increase the amount of edamame beans, hold the crab and replace the Kewpie Japanese Mayonnaise with a vegan brand mayonnaise instead. If you want to make this super easy crab salad gluten-free you will need to use gluten-free imitation crab meat and a certified gluten-free mayo. We have one word of caution if you are diagnosed as celiac. Do not use Kewpie Brand Mayonnaise as it made with malt vinegar and this product should be avoided. There are plenty of Gluten-free brand mayonnaise on the market but make sure to read the labels. 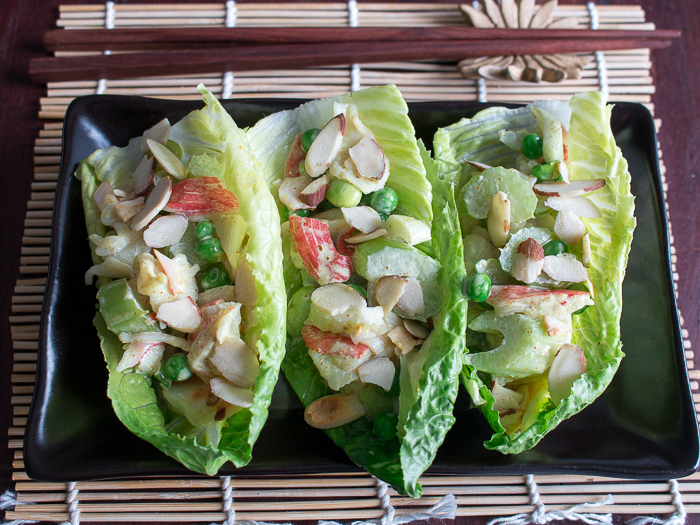 This super easy crab salad is delicious served inside a lettuce cup, on a sandwich, piled high on a cracker or plain just on its own. If you are looking for a refreshing dressing have you tried our Framboise Osmanthus Rose Vinaigrette? 1Add sliced almonds to a dry pan and toast until just slightly toasty around 2 minutes . Remove from pan and allow to cool. 2In a medium bowl, add celery, imitation crab meat, mayonnaise, curry powder, edamame beans, salt , white pepper to taste, frozen peas and toss. 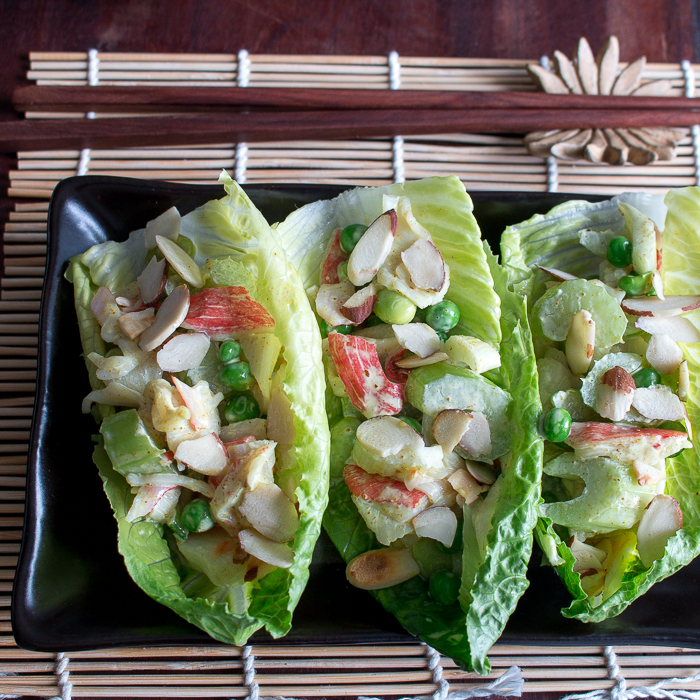 3Lay out your lettuce cups on a plate, spoon in the crab salad and top with roasted almonds. (Optional) or just enjoy as is or on top of cracker or in a sandwich.